A gunman who apparently revealed his intent to "take 2 of theirs" on a social media site, ambushed and fatally shot two NYPD officers in their squad car Saturday, investigators said. Police Commissioner Bill Bratton condemned the attack as an "assassination." The two officers, Rafael Ramos and Wenjian Liu, had no chance to defend themselves and might not even have seen their assailant, Bratton said. The shooter, identified by police as 28-year-old Ismaaiyl Brinsley, approached the patrol car at 2:47 p.m., took a shooter's stance, and fired several shots through the passenger side front window, the commissioner said during a news conference at Woodhull Medical Center. Both officers were struck in the head. After firing on the officers, Brinsley ran into a nearby subway station and turned his weapon on himself, Bratton said. Brinsley died from the wound. Police recovered a silver 9mm handgun at the scene. Investigators believe the gunman posted a threatening message on a social media account before the shooting, according to one law enforcement source. "They take 1 of ours, let's take 2 of theirs," said the post on Instagram, which was accompanied by a photo of a silver handgun. "I'm putting wings on pigs today," the post added. Investigators believe Brinsley shot and injured his ex-girlfriend in Baltimore before coming to New York, Bratton said. Brinsley went to Baltimore to try to get back together with his ex-girlfriend, but when she declined, he became violent and shot her, a senior law enforcement official familiar with the investigation said. Brinsley arrived in New York via a bus that came through the Lincoln Tunnel and arrived at the Port Authority Bus Terminal around 11:00 a.m., police said. Brinsley then traveled to Brooklyn on the subway and ditched the cell phone near the Atlantic Yards complex, police sources said. The mother of Brinsley's ex-girlfriend warned Baltimore police about the Instagram posting around 1:30 p.m. and said she thought Brinsley had ties to a church along Church Avenue in Brooklyn, said a police source briefed on the situation. Baltimore police called New York's 70th precinct after 2 p.m., and then faxed a wanted poster for Brinsley to New York at 2:45 p.m., police sources said. 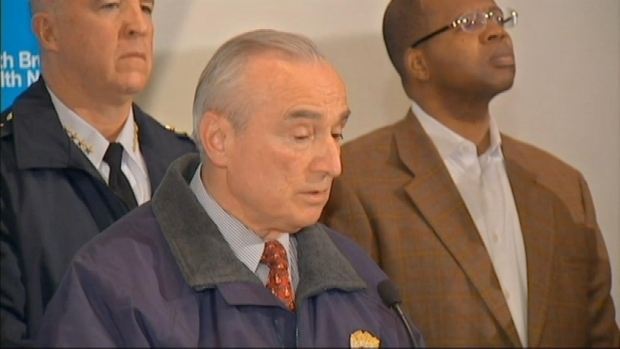 Police Commissioner Bill Bratton spoke Saturday about the slain officers. The NYPD received the fax just moments before the attack on Ramos and Liu, a "tragic irony," Bratton said. Baltimore County police continue to investigate the earlier shooting there. Criminal records show Brinsley has a history of arrests on various charges in Georgia, including robbery, shoplifting, carrying a concealed weapon, disorderly conduct and obstruction of a law enforcement officer. Bratton said his last-known address was in Georgia. Police said Brinsley had an 11-month-old baby with a girlfriend who lived on Nostrand Ave. in Brooklyn. Police also believe his mother lives in Crown Heights. Brinsley's mother and sister told the NYPD that he was a violent person and that they were afraid of him. Mayor Bill de Blasio called the shootings a "particularly despicable act" and asked residents to pray for the officers and their families. "Our entire city was attacked by this heinous individual," he said at a news conference. "Our city is in mourning. Our hearts are heavy." 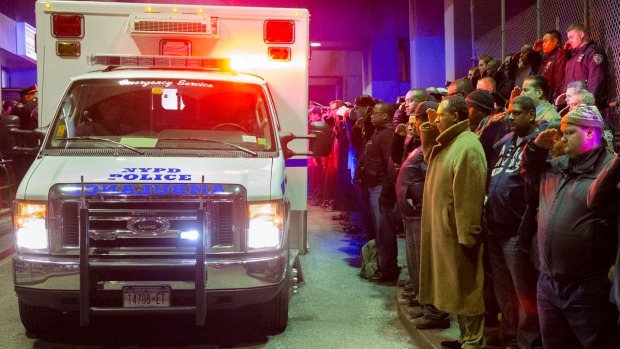 Police Benevolent Association President Patrick Lynch mourned the slain officers outside the hospital and linked the killings to violence against the NYPD during recent protest demonstrations and to what he said was the mayor's lack of support for the department. "There's blood on many hands tonight," Lynch said, adding that it "starts on the steps of City Hall in the office of the mayor." De Blasio responded that Lynch's remarks amounted to "irresponsible, overheated rhetoric that angers and divides people." The killings come as the NYPD faces scathing criticism for their tactics, including the chokehold death of Eric Garner, a black man who died when white police officers attempted to arrest him for selling loose, untaxed cigarettes. A grand jury decided on Dec. 3 not to indict any officer in Garner's death, sparking protests in New York and other cities nationwide. Three people have been arrested in connection with attacks on police at a protest march on the Brooklyn Bridge. The grand jury decision in the New York case exacerbated public outrage over a Missouri grand jury's decision not to indict a white police officer in the fatal shooting of Michael Brown, an unarmed black teenager. The Rev. Al Sharpton, who has spearheaded protests, said the Garner family was "outraged" by the slaying of the two officers. Gov. Andrew Cuomo echoed the sentiments of many elected officials who mourned the deaths of the officers. "This deplorable act of violence is the opposite of what New York is and what New Yorkers believe in,' he said in a news release. "Tonight we all come together to mourn the loss of these brave souls." Attorney General Eric Holder condemned the shooting deaths as senseless and "an unspeakable act of barbarism." The mayor ordered that flags in the city be lowered to half-staff from sunrise Sunday until the officers' burial. 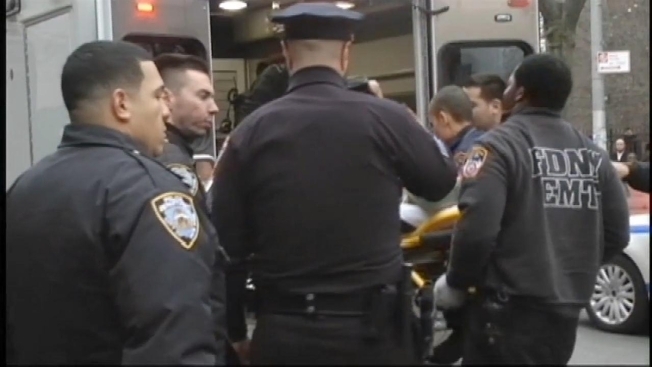 The last shooting death of an NYPD officer came in December 2011, when 22-year veteran Peter Figoski was shot in the face while responding to a report of a break-in at a Brooklyn apartment. The triggerman, Lamont Pride, was convicted of murder and sentenced in 2013 to 45 years to life in prison. NYPD police partners have been killed in the line of duty seven times since 1972, primarily in "mindless assassinations," Bratton said.